The latest addition to the global Shangri-La family has opened in Northern China’s Hedong District. The Shangri-La, Tianjin is situated in the heart of the lively city, while nestled amongst historic Tianjin architecture and overlooking the serene Haihe River. Being China’s largest northern port city and only 30 minutes by high rail speed from Beijing, Tianjin is a vibrant destination popular with business travellers. While the dynamic dining scene, tranquil river and 19th century architecture entices recreational travellers. Boasting 302 rooms, the luxury accommodation is close to the major train station and conveniently located five minutes from the city’s CBD. Each of the expansive guestrooms complete with indulgent amenities looks over the Haihe River. 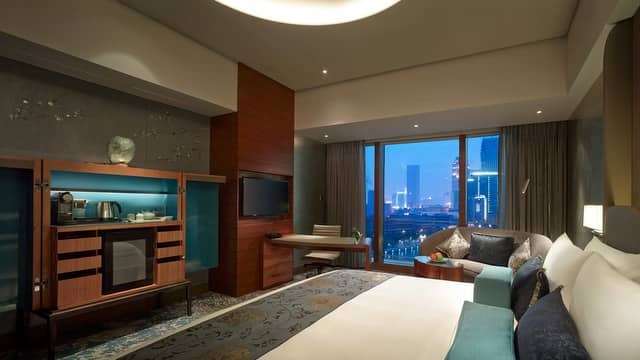 Offering one of the biggest deluxe rooms available in Tianjin as well as 39 serviced apartments, there is a variety of accommodation styles suited for business and pleasure. Complimentary Wi-Fi is available throughout the hotel and the Horizon Club Lounge invites guests to take in panoramic views of the city. This luxury hotel boasts a 24-hour gym, indoor swimming pool, two outdoor tennis courts, Jacuzzi, sauna and steam room as well as a spa offering relaxation treatments. Dining options are covered with the Shang Palace restaurant offering authentic Cantonese fare and Café Yun featuring six open kitchens to tempt the senses. The hotel also has ample private facilities for business meetings and conferences of all sizes. This five-star hotel is the only accommodation of its kind in the city to be linked to a shopping centre, River View Place. This opens up a world of dining and entertainment options. Set to open in 2015, the 1,700 squared-metre Kids Adventure Zone will keep children entertained with interactive games, activity centres for crafts and much more. For reservations, please visit www.shangri-la.com or contact the hotel directly on (86 22) 8418 8666 or email [email protected].